What to do with a bumper crop of cucumbers? Why, make pickles, of course! I’ve been reading a lot about how to make cucumber pickles and the science of the fermenting process and I have to say, it scares me a little. The whole bacteria management of true pickle making is really not made for my seemingly random and inconsistent personality. I have a limited attention span, people, and I need recipes that embrace that (because at this point in my life, I will probably not become focused like a laser beam). Enter the Bread and Butter Pickle. Simple. Fresh. Easy. A pickle recipe made for a mom who often forgets why she walked downstairs, only to remember once she goes back upstairs. You know. That kind of thing. I don’t do sourdough starter for that reason either. I made these pickles using locally grown, Kirby pickling cucumbers, which are in absolute abundance here right now. 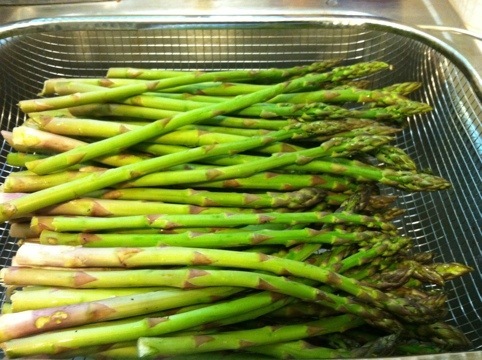 In fact, I may plant some next year because they are taste good all by themselves and they are nice and small. I like this recipe because it is pretty quick and doesn’t call for a commercial pickling mix. It also doesn’t require weeks on tending while the cucumbers slowly ferment on my counter top. This recipe is from my favorite canning book, Put ‘Em Up! Layer the cut cucumber and onion with 1/2 c. salt in a large bowl. Cover with a layer of ice cubes and let sit for 2 hours. Drain and rinse. Combine the vinegar, water, sugar, mustard, peppercorn, celery seed, turmeric and remaining salt in a large, nonreactive pot and bring to a boil. Add the drained vegetables and return to a boil, stirring to ensure all vegetables are heated through. Remove from heat. 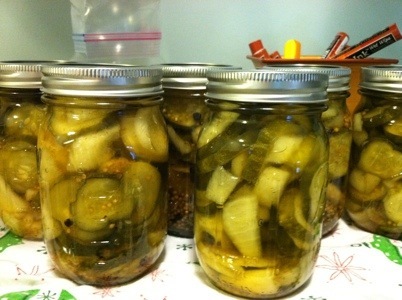 Store pickles by either ladling into bowls and jars and storing in the fridge for up to 3 weeks or can. If canning, ladle the vegetables into clean, hot pint canning jars. Add the brine to the jars, leaving 1/4″ headspace. Release any trapped air. Clean the rims, add lids and collars. Process for 10 minutes. Turn off heat and let sit with lid off of the canning pot for 5 minutes. Remove jars and set aside for 24 hours. Check seals and store jars for up to 1 year.